An amazing project that features SR Timber’s stunning cedar shingles has been put forward for a prestigious roofing industry award. The owner of the Stable Complex in Hertfordshire specifically chose our western red cedar shingles as a fundamental part of the design after travelling through America and being spellbound by the natural aesthetics of shingles and how they weather over time. 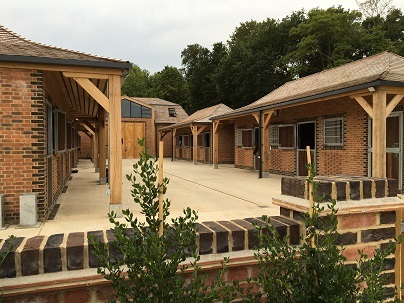 Cedar shingles were also specified for the project because the stables are set in a woodland area, and the architects who designed the buildings wanted to ensure that the structures blended perfectly within the natural surroundings. The first is that they are truly renewable and sustainable and therefore make an ideal roofing solution for projects where environmental considerations are important (our suppliers have a policy to re-plant three trees for every one harvested within one year and to the exact species ratio of the trees that were harvested. PEFC Certified shingles are also available when full chain of custody is required). Because they have one of the lowest carbon footprints of any building product, they can also significantly contribute towards zero-carbon housing achievements. The second is that they are lightweight, are extremely durable and offer excellent natural insulation properties, with a value of K = 0.1067 W/M degrees C. That’s a very impressive figure. Thirdly, it’s all about the quality. There are a number of grades of western cedar shingle, but SR Timber exclusively favours Blue Label – the highest grade that is available, which complies with the strict standards set by the Cedar Shake and Shingle Bureau. Blue Label shingles originate from 100% heartwood, use 100% edge grain and are 100% clear. The final, and arguably most important, reason is the way they look and the fact that they weather so beautifully over the years and transform into a gorgeous shade of silvery grey. Given that they have a life expectancy in excess of 50 years (when treated with Tanalith ‘E’ preservative), they can be the showpiece of any building structure. Although they are still seen as something of a niche roofing product, the diversity of usage – such as the Stables Complex project – highlights why the popularity of western cedar shingles is on the increase, and we’re keeping our fingers crossed that this particular case study wins big at the awards. You can download our datasheet on SR Timber’s cedar shingles to see the technical details of the shingles and how-to specifications for installing them.